The first day of the holidays, and in celebration of the winter feast I thought I'd look at recipes for hippocras - that stalwart festive cordial wine popular since medieval times. Taking its name from the conical bag shaped like the Sleeve of Hippocrates (used by apothecaries, vintners or housewives) to strain the spice from the liquor, hippocras (hypocras, ipocras) was drunk at the end of a high-status feast to balance the humours, as a sweet and efficacious digestive and carminative. It could be made with red or white wine, sugar and cinnamon being the main constituents, and often a variety of other ingredients. I’d be the first to admit that mulled wine made badly can be truly horrible (am thinking of the sour, mouthcurdling addition of a carton of orange juice, which is surely one of the most vile culinary perversions ever to be concocted, and which resulting clouded and sickly purple looks exactly like the colour of painters’ turpentine when the brushes have been rinsed too much in it, and probably tastes worse). But these recipes sounded like a beautiful aromatic treat, and after reading quite a few, I experimented, trying to be fairly accurate but according mostly to the ingredients already in my cupboard (no spikenard...). 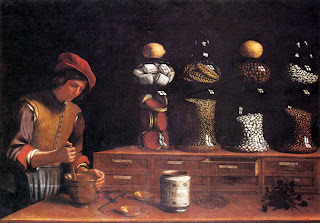 Here’s an example: ‘To make powdered hippocras, take a quarter of very fine cinnamon selected by tasting it, and half a quarter of fine flour of cinnamon, an ounce of selected string ginger (gingembre de mesche), fine and white, and an ounce of grain [of paradise], a sixth of nutmegs and galingale together, and bray them all together. And when you would make your hippocras, take a good half ounce of this powder and two quarters of sugar and mix them with a quart of wine, by Paris measure. The Goodman of Paris tells us that after dessert of fruit and compotes came the ‘departure from the table’ – hippocras and wafers called mestier. ‘…Waffurs to ete, ypocras to drynke with delite. Now this fest is fynysched, voyd the table quyte.’ (1393) In his suggested menus for dinner for a Meat Day for great lords and others, one sixth course was hippocras with wafers (rich batter cooked between hot iron moulds on a chafing dish, and sweetened with honey and rosewater), pears and comfits, medlars and peeled nuts. Another includes sugared flawns and larded milk, cooked pears and hippocras. He also mentions the purchase of ready-made hippocras from the spicer, buying 3 quarts at 10s. the quart (which surely seems very expensive?) Lump sugar could also come from the spicer, grocer or mercer, or would have been bought, along with dried fruit and other items for the banquet course, at fairs such as Lenton. 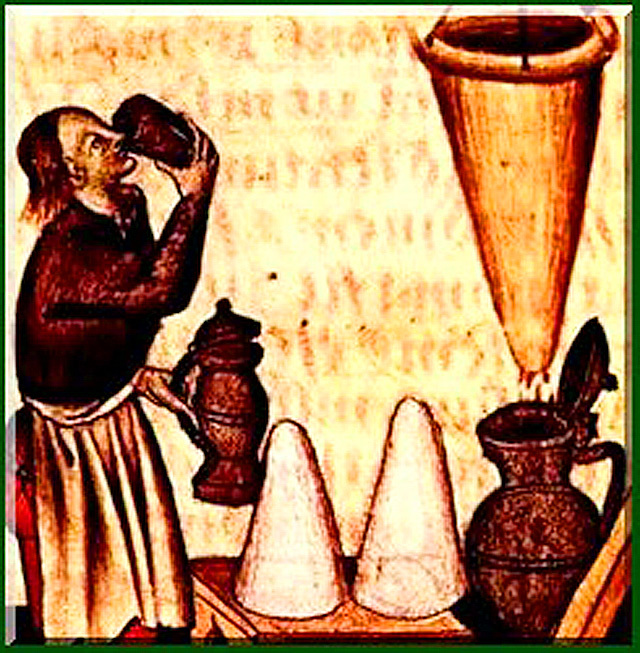 Hippocras is not, apparently, to be confused with piment or clary, which were similar but made with honey instead of sugar, but there are very many differing methods and quantities to be found, according to personal taste and availability of spices. Sugar itself was considered a spice, and to have medicinal qualities. Lower orders, perhaps yeoman farmers, merchants and the like may have used honey in its stead. John Russell’s 15th-century Boke of Nurture gives a detailed, rhyming method for hippocras, you can read it here at Project Gutenberg. It is generally said to have fallen out of favour by the 18th century, though James Boswell notes in his diary on the 19 Jan 1763 that he ‘went into a little public house and drank some warm white wine with aromatic spices, pepper and cinnamon’. red Hippocras (after the Goodman of Paris, 1393). Peel and chop ginger, break cinnamon into pieces and grind as finely as possible with other spices in pestle and mortar until small, then add sugar and grind until thoroughly combined. Add red wine and heat gently in a pan for about 5 min then remove from heat, strain through jelly bag or muslin and serve in tiny glasses. Sipped hot straightaway, it has an extraordinarily warming hit. Cold the following day, it’s pungent, with the consistency of green ginger wine, but a much more complex flavour. white Hippocras (after Hannah Woolley, 1675). Grind spices as above, then add and grind sugar, then rosemary. Stir into white wine and leave to steep for 12 hours or overnight. 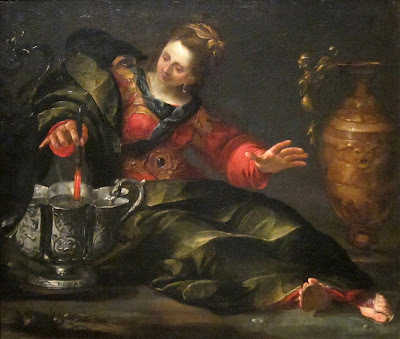 (NB – the mixture is not heated.) Strain, then stir in cream before serving in aforementioned tiny glasses. This one really is quite unlike anything else I’ve ever tasted – perhaps like a rich, exotic lassi? Very fine and scrumptious. If I could only use one adjective to describe it, I would say it was exquisite. Sounds delicious! I have some of those things in my pantry, not all. I tend to buy powdered spices, though I do have fresh ginger. Will try at least one of those two. Mind you, where I am it's summer, not really time for spicy stuff. I am so having these on Christmas Eve! Lovely post. Oh what a fab post! Am off to make myself a hogshead of it now. But what are "sugared flawns"!! Caroline - sugared flawns would be like our flan; custard tarts. Mnn, yummy! That's what we can do on New Year's Eve ... but which one? Of the two, which do you prefer, Jane? Thank you so much for all the research (hic!) that has gone into this post! Thank you for the festive recipes. I shall enjoy having a good try-out of these - desserts, I think you said? Oh, Jane, those recipes look a-m-a-z-i-n-g! Must try them. Happy Christmas!